On May 14, 1948, the Jewish People’s Council officially approved a proclamation establishing the independence of the State of Israel. Eleven minutes ater Israel’s proclamation of independence, U.S. President Harry Truman signed an executive order granting de-facto recgnition to the Jewish State. Truman’s act made the United States the first country in the world to recognize Israel. 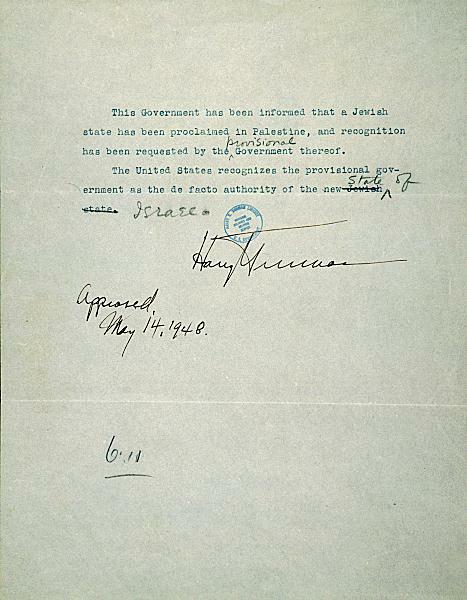 Less than seven months later, President Truman extended America’s de-jure recognition to Israel. ← International Fellowship of Christians & Jews a Scam? Anti-Trump protests erupt across the US Nationwide protests against Donald Trump have erupted in the day since he was elected President.